I'm looking for something with the physical properties of pasta (spaghetti or similar, not lasagne). Something that I can toss with a sauce or oil and serve in a large bowl for a weekday supper. Something grain-free and natural. I've tried a large onion cut into thin strips (probably the most successful) and leeks (tend to be too floppy / wet). 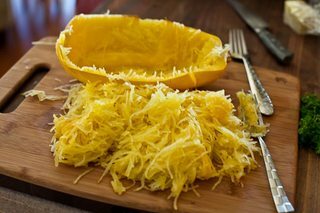 The classic example would be spaghetti squash. It has the unique property that when you cook it, it can be pulled apart into long, thin, pasta-like strands. You can then sauce it or use it in a manner analogous to pasta, but its nutritional profile is far more similar to squash, because, well, it is squash. 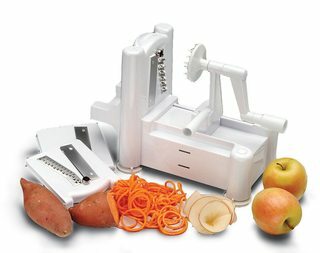 Have you tried spiralized zucchini, yellow squash or carrots? 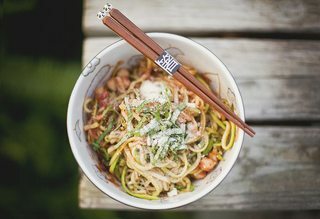 Shirataki noodles are quite the rage, although I've never actually tried them. I understand that they smell fishy when you first open the package, but that goes away. They claim to be made of naturally water soluble fiber with no fat, sugar, or starch. Supposedly some varieties have zero net carbs and zero calories. They have been recommended for Italian style and Asian style applications. I need to place an Amazon order anyway, so I'm going to give them a try. Look around at the reviews, that will give you some kind of idea what they are (besides expensive). EDIT: Now that I've tried them, I can say that I kind of like them in Asian style applications (especially soup). I can't even imagine them with a marinara type sauce, I think they'd be awful. They'd probably be fine with any kind of seafood. The packages are smaller than I realized, so they are even more expensive than I thought. For me, they are pretty close to price prohibitive. One that I've had a lot of success with is shredded cabbage. You can easily and quickly cut it into strips of varying width depending on the pasta you are trying to mimic. Lightly boiled in some salt, and served with the sauce of choice the top it comes out quite well. In italy we have protein based pasta. It's kinda tasty and it's low on carbs (percentage may change depending on brands). You could consider Miracle Noodle. Not the answer you're looking for? Browse other questions tagged low-carb or ask your own question. Low Carb Pizza Dough Recipe - How Will This Make Dough? How can low-carb bread rise?